The law enforcement union, National ICE Council, criticized Portland Mayor Ted Wheeler for his decision to block the Portland Police from assisting U.S. Immigration and Customs Enforcement officers while they were being attacked by violent protestors. This is a violation of US Constitution where the 14th Amendment which provides equal protection under the law. At the same time Portland is working on a proposal to outlaw plastic straws — something that one California city has outlawed and set a $1000 fine and a maximum 6-month jail time for offenders. Portland Mayor Ted Wheeler is turning an honorable law enforcement agency into a liberal left-leaning politicized operation where you don’t apply civil rights to people you dislike (See ACLU blasts Wheeler, Wheeler fails to protect parade) and you waste too much time and taxpayer resources chasing new politically correct crimes to please a tiny fraction of a political base. 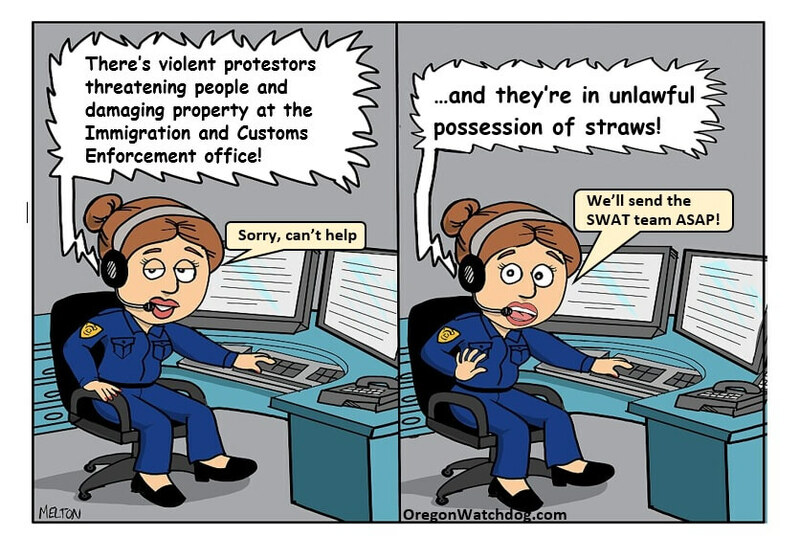 This is happening at the same Oregon liberal politicians are reducing prison time for serious crimes like auto theft, identity theft and property theft (see more here) while they create new crimes for minor infractions which end up clogging up our courtrooms and interfering with real criminal law enforcement. — Spread the message by emailing this article, Facebook Like, Tweet or linking it. You can also donate to the Taxpayer Association of Oregon here. — Read more on the recent ICE-police scandal at the Willamette Week here.